Okay, so not everyone likes lamb. But I have served this numerous times to guests who claimed to disdain this meat, only to have them eat a lot more than their fair share. If you buy a boneless leg of lamb, it will make your job much easier. If you buy a bone-in leg, though, it will cement your friendship with Fido. Also, California or Australian lamb is preferable to New Zealand lamb, but even the Kiwi offering will not disappoint. Trim the fat cap from the lamb. Then cut the leg of lamb into approximately 1 1/2 cubes. Place into a large bowl and sprinkle the Wild Game Rub over the meat, tossing until evenly mixed. If you don’t have our rub available, mix together a teaspoon of brown sugar, a teaspoon of salt, 1/4 teaspoon of ginger, and 1/4 teaspoon of turmeric. 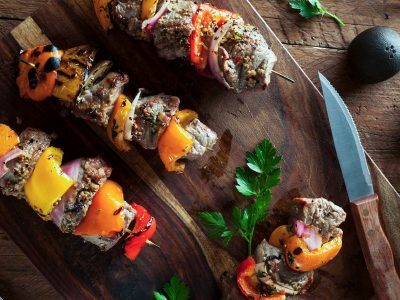 The WIld Game Rub has several additional exotic spices in it, but this shortened version will get you by until you barbecue that elk backstrap. Rough-dice the onion and place in a large bowl. 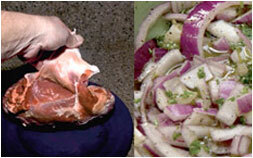 Chop a few sprigs of fresh parsley and add to the onion. In a separate bowl, mix one cup of olive oil, one cup of sherry, and one tablespoon of ground black pepper. Peel five cloves of garlic and either use a garlic press to mash them or the side of a butcher’s knife. Add the garlic to the liquid and beat until frothy. Add the liquid to the onion. Mix thoroughly. 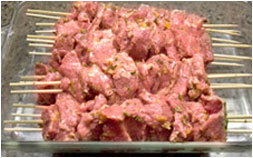 Now, pour the onion mixture over the lamb cubes, cover , and refrigerate overnight. 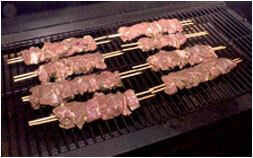 Skewer the lamb chunks onto 2 wooden skewers. If you use only one, then turning them will cause you some difficulty as the single skewer will just rotate inside the meat. Two insures that you can flip them easily. Pack the meat on tightly. 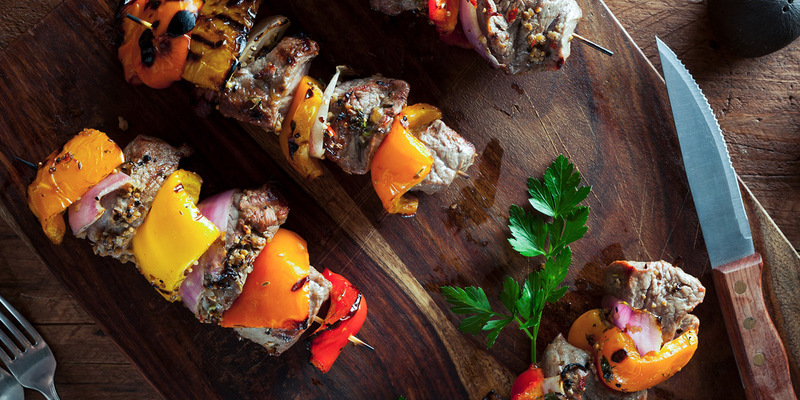 Grill these kabobs at 180-190°C(360-380°F) for 25-35 minutes or until done. Lamb is best when cooked medium-rare, but not everyone likes that. 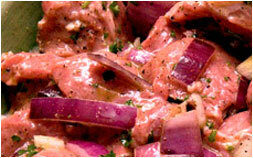 It will taste great and still remain fairly tender even if cooked medium-well.